Tiggerific Tuesday Trivia - BTMRR Opens! September 2, 1979: The day BTMRR opened at Disneyland! Hello everyone, and welcome to this week’s Tiggerific Tuesday Trivia post! Today I’m joined with my friends Jodi from Magical Mouse Schoolhouse (who is soaking up the Disney Magic as we speak! ), Jenn from Disney Babies Blog, and Heidi from Heidi’s Head. Thanks friends for joining us! 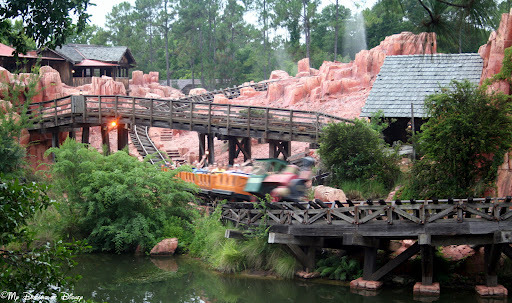 Today I have a couple of different trivia tidbits for you, but the first one involves one of my favorite Disney roller coasters — Big Thunder Mountain Railroad! It was on this day in 1979 that BTMRR opened at Disneyland, 34 years ago! Regular readers will remember that I have featured it before in the Tiggerific Tuesday Trivia posts, but that was for a different reason, so I decided it’s anniversary date was reason enough to feature it again. Unfortunately we were unable to ride it when we went out because it was going through a major refurbishment, but I love riding it at Walt Disney World! For the record, the Walt Disney World version opened on November 15, 1980. Now, of course, today is also Labor Day in the United States, and I found something in this day in Disney History that I just had to share with you. It turned out that on this day in 1959 the Donald Duck short cartoon How to have an Accident at Work was released! Now, Labor Day was first started in 1882, and the first state observance was in 1887 in Oregon, but by 1959 had been an established holiday for many years. As a result, I can only think that the date for this short to be released was not an accident, and proved just how much of a sense of humor Walt Disney and his staff had. Now, for your enjoyment, I present How to have an Accident at Work, via YouTube! Enjoy, but remember, it’s just a cartoon, not something you should strive for in your own jobs! Thanks for stopping by today, now, go check out the rest of the entries for this week! Have fun, and be careful — accidents happen naturally, don’t do anything to bring them on yourself! Thanks Jenn! I still get tickled to think about who was responsible for posting that on what was probably Labor Day in 1959 — or at least, very close to being Labor Day! My husband and I were just watching that short the other day! Soo funny! Big Thunder Mountain was a highlight of our trip this year. Emily decided to take it on for the first time, since she was finally tall enough to experience it. She loved it and has already told us she is riding it “lots of times” on our next trip! Ha, love the cartoon and Big Thunder is our sons favorite ride at the Magic Kingdom. Wanted to ride it at Disneyland but looks like it’s still under referb when we are there in a couple weeks. Previous Post: Making Magical Memories and avoiding Disney Letdown! Next Post: Wordless Wednesday – September Calendar Shot!